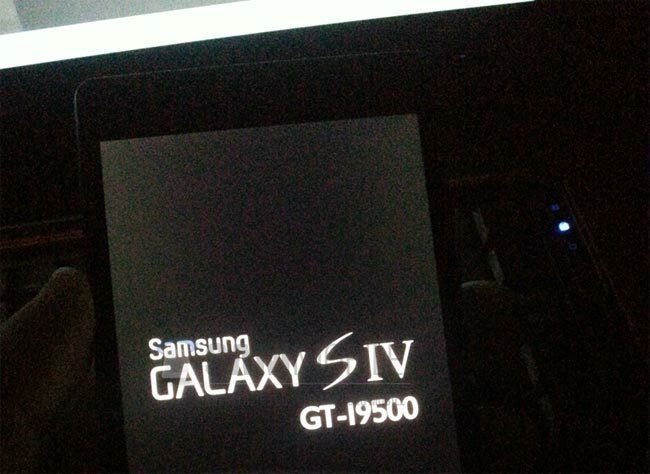 The Samsung Galaxy S4 has turned up in some benchmarks, the S4 comes with the model name GT-i9500, and now the device has appeared in Rightware’s browser 2.0 database, and it has recorded the highest score of any device to date in the database. 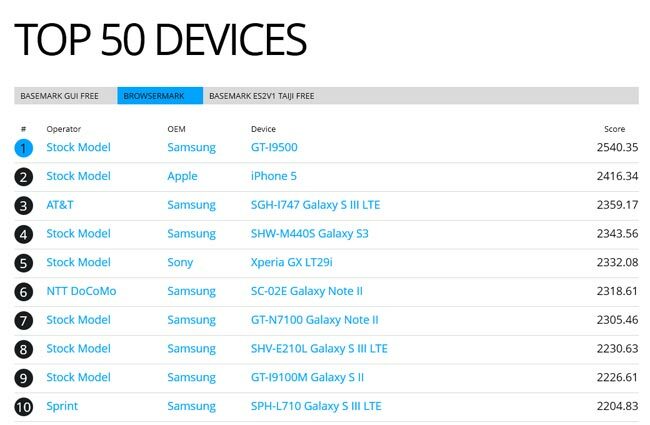 The Samsung Galaxy S4 is now shown as the top device in the Browsermark database and it was tested in the database with Google Chrome, as you can see in the second photo below. We are expecting two versions of the Samsung Galaxy S4 to be announced later this month, one for the US and one for Europe, both devices will apparently share almost identical specifications except for their processor. The US variant of the Samsung Galaxy S4 is rumored to come with a quad core Qualcom Snapdragon 600 processor with a clock speed of 1.9GHz, the European version of the Galaxy S4 is rumored to come with Samsung’s 8 core Exynos 5 Octa processor clocked at 1.8GHz. The Samsung Galaxy S4 will also come with 2GB of RAM and a choice of either 16GB, 32GB or 64GB of, and it will feature a full high definition 4.99 inch display with a resolution of 1920 x 1080 pixels. Other specifications on the Samsung Galaxy S4 include a 13 megapixel camera, and the device is rumored to come with a new camera feature called Samsung Orb, this is expected to be similar to Photo Sphere in the latest version of Android. The Galaxy S4 will come with Android 4.2 Jelly Bean, and it will also include some new features that Samsung will be introducing for the first time with the S4 launch, which will include touchless gestures and also new eye tracking technology. With the eye tracking technology, we do not know exactly who this will work, although we can guess with the names that Samsung has filed for the patents on the technology which include Eye Scroll and Eye Pause, for example Eye Pause could be used to pause a video you are watching on your Samsung Galaxy S4 when you move your eyes away from the display. The touchless gestures could be used to perform an action on your Samsung Galaxy S4 without having to touch the display, for example if you want to answer an incoming call on your Galaxy S4 you would just lift the handset to your ear to answer the call, rather than pressing a button first. Other new features that we are expecting to see for the first time with the Samsung Galaxy S4 is Samsung Wallet, similar to Apple’s Passbook. this new feature was announced recently and it will appear in future Samsung devices, we are also expecting to see NFC payments with the Galaxy S4 as Samsung recently teamed up with Visa. Samsung are holding their Samsung Galaxy S4 event in New York on the 14th of March, the event will also be streamed live in Times Square and we are expecting the S4 to go on sale in April. We previously heard that the Galaxy S4 would go on between the 15th and 22nd of April, this was revealed to us by a source here in the UK, and now it would appear that the handset will launch worldwide in April.